African Union research papers overview the political alliance between 54 African nations. The African Union (AU) is a political alliance between 54 African nations. Only Morocco is not a member. 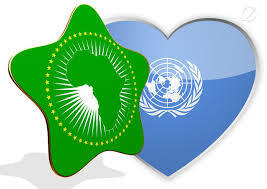 The African Union was established in May 2001 and replaced the earlier Organization of African Unity (OAU). Important decisions of the African Union are made at semi-annual gatherings of the heads of state of the various members. The AU is headquartered in Addis Ababa, Ethiopia. The reason that Morocco is not a member is that it objects to Western Sahara as a member nation, a disputed territory on the west coast. Attempt to raise the standard of living of all Africans. It consists of the Assembly of the African Union, the meeting of the heads of state, plus a representative body, the Pan African Parliament, a 265-member assembly elected by the various national parliaments of the member nations. Its headquarters complex is located in Addis Ababa, a gift from the Chinese government. Africa and Economic Growth Research Papers discuss a preview of an order placed for a literature review with specific questions to be answered. Paper Masters writes custom research papers on African Union and overview the political alliance between 54 African nations.